Not seeing Ponyo in this year's Oscar nomination for Best Animated Film was quite a heartbreaker. Truth is Japanese filmmaker Hayao Miyazaki is what Sachin Tendulkar is to cricket. They're both Gods of their respective fields. And to have Miyazaki's exquisite creation overlooked to accommodate Disney's The Princess and the Frog didn't strike like a very bright idea. It still doesn't. Oscar grievances aside, the film, in all fairness, is a delightful 2-D treat highlighting the intricacy of hand-drawn animation, vibrancy of colours and spunky music. Practically every sequence bears a wondrous theme palette ranging from electric purples, neon greens and amber yellow. And since it's formatted like a Broadway-styled musical, the creators have a wild time conjuring exhilarating imagery. As you soak in the entire razzle dazzle, The Princess and the Frog presents itself as a story set in New Orleans, sometime in the 1920s, where its central protagonist Tiana (the cherubic, young voice of Elizabeth Dampier), gifted with extraordinary culinary skills, dreams of setting up a lavish restaurant with her daddy (Terence Howard delivers a velvety cameo). Years pass and Tiana (Anika Noni Rose, lends her animated alter ego an air of silver and a sound of gold) grows up to be a multi-tasking waitress, slogging day and night to save enough for her stylish eatery to fulfill her now deceased father's wish. On the side, there's a tapped out Prince Naveen (A very, very charming Bruno Campos) from the mythical country of Maldonia. A smooth talker with no skills, Naveen comes to New Orleans with the hopes of marrying an affluent heiress, namely Charlotte (a playfully endearing Jennifer Goody), the starry-eyed albeit saucy, spoilt yet good-natured daughter of a sugar mill owner (John Goodman pitches in a stocky voice over). But before he can get to her, he's swindled in a jaw-dropping array of fast-moving artwork (around the wicked ditty Friends on the Other Side) by a power-hungry black magician, Dr Facilier (Keith David spews easy-going menace with his sharp baritone) who promptly turns him into a frog while his sidekick Lawrence takes his form and sets out to court an unsuspecting Charlotte. Meanwhile, Naveen, with the intention of warding off the spell, mistaking Tiana to be a princess, lures her into a kiss. What follows is an unexpected twist to Brother Grimm's The Frog Prince forcing the duo to explore the bayous and in the process discover their 'needs' from their 'wants'. Good and evil, as always, are distinctly sketched out in Disney's cartoons. And so while Dr Facilier is a crooked cross of Captain Hook and Jafar, there's much warmth and goodness to be found in the wide-eyed candour and brightly-lit smiles of Tiana, Naveen or even Ray (Jim Cummings drips with sugar, spice and all things nice), the mushy Firefly. It must be said though that Prince Naveen is by far the most fun of all the Prince Charmings Disney's churned out over the decades. While his name suggests some sort of Indian connection, his accent bears thick resemblance to Antonio Banderas' Puss in Boots. Tiana, on the other hand, lives up to Disney's stereotype of a golden-hearted miss. The only change here is that she's an African-American but her race is never a bone of contention or speculation to the proceedings. It's Walt Disney, what do you expect? She's one of their more sensual creations though, even in her slimy, correction, mucousy avatar but not feisty enough to make it in the league of the spirited Belle, plucky Jasmine or gutsy Mulan. Though Ray is affable and Louis, the trumpet-obsessed alligator brings in a chuckle or two, neither of these supporting characters as memorable as say Baloo, Flounder, Dora, Mrs Potts or Timon & Pumbaa. Dr Facilier, however, lives up the Disney tradition of raucously-hissing, severe looking bad guy to the hilt. Levity, strangely, is not of the mainstays of The Princess and the Frog's narrative. Considering its proximity to Shrek's outline, it doesn't adopt the unconventional cheekiness of the latter, which broke quite a few norms, instead opting for the safer tried-and-tested route. There's no shortage of opportunities but makers Ron Clements and John Muskers keep the focus on romance and nobility. To their credit, they work up a bunch of unbelievably gorgeous moments during songs like Gonna take you there and Ma Belle Evangeline with some hundred thousand fireflies overpowering the screen with their luminous magic. 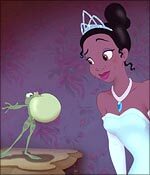 Ultimately, The Princess and the Frog resists any controversy by broaching too much on the heritage of its New Orleans-inhabiting heroine. Nevertheless, it inspires Academy-winning composer Randy Newman to employ the city's glorious music culture to dole out some lilting bits of jazz and gospel. What works primarily in The Princess and the Frog's favour is its apparent dedication to uphold and excel a tradition we've all grown up loving -- good old traditional Disney animation. And even if it's not anywhere close to the magic of Aladdin or The Beauty and the Beast, it's worth a watch simply because you don't have to be an amphibian or royalty to enjoy the enchantment of fairy tales or the power of a well-meaning kiss.